The Perfect Pint is a welcome departure from the typical Irish bars that proliferate Midtown Manhattan. With thirty beers on tap and our own brews, The Perfect Pint has come to be known as NYC"s premier venue for great food in a traditional Irish atmosphere. 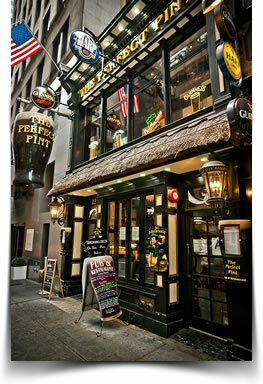 At the Perfect Pint West, enjoy our outdoor balcony that overlooks busy Times Square. At the Perfect Pint East, you can have a relaxing smoke while sipping your favorite drink outside on our smoking loft overlooking 45th St. Located at 123 West 45th Street (between 6th & Broadway), The Perfect Pint West is conveniently situated minutes away from any Broadway Show and is in the heart of Times Square NYC. 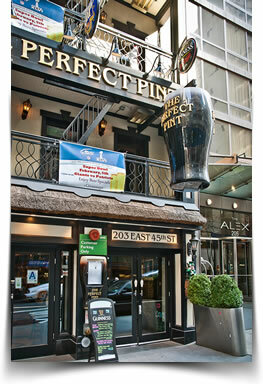 The Perfect Pint East, located at 203 East 45th Street (between 2nd and 3rd Ave), is a favorite meeting spot in Midtown East. We offer a unique environment for happy hours, business functions, family gatherings and alumni reunions. The Perfect Pint's three floors can accommodate parties from 15 - 350 people. Large TV screens show every major sporting event. Come join us for a great time!